One of the largest expenses associated with installing and owning a retail software system is the cost of maintaining that system. When software upgrades are available, often times the labor expense required to send someone out to each store to install the upgrade is greater than the price of the software itself! XpertMart™ includes two features that make it easy to install software upgrades across a chain of stores remotely from the Main station . 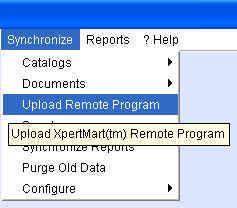 The Upload Remote Program and the Synchronize Reports features allow you to use XpertMart™'s synchronization process to send new versions of the software and new reports out to the stores. And since these two functions can be programmed into the Scheduler , the need for having someone travel out to the stores to do the installation is dramatically reduced. The Upload Remote Program function can be run at the Main station. If there is a file called "XpertMart.jar" in the C:/Main/Out folder it gets synched up to the FTP Server . 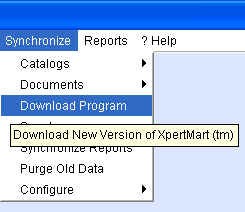 This way if you have a new version of XpertMart™ at the Main and want to send it to all the stores all you have to do is put it in the "Out" and run this process. This process can also be scheduled to run automatically using the XpertScheduler™ tool . If there is no file called "XpertMart.jar" in the "Out" folder the system does nothing and continues with the other things it has been scheduled to do. The process can also be scheduled. When the process runs, the system will look for the XpertMart.jar file on the FTP Serve. If it finds XpertMart.jar on the FTP Server it downloads it to its C:/Main/In folder. Note that this does not install or replace the current XpertMart.jar in the C:/Main directory-- that would have to be done separately. If there is no XpertMart.jar on the FTP server it does nothing and continues. 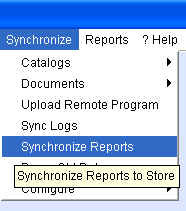 The Synchronize Reports process copies the entire report tree (all subfolders and reports found in them) it finds at a folder specified in the Synchronize>Configure Main Synchronziation>Reports Out Directory menu. In the example above, the system will take all folders and .rpt files found in the C:/Main/StoreReports directory and upload them to the FTP Server . 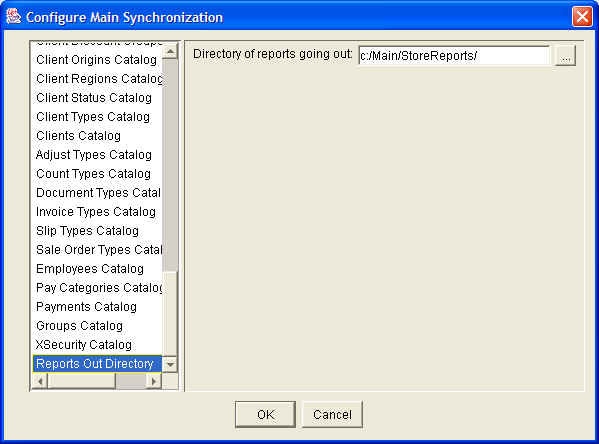 Note that this directory is separate from the C:/Main/Reports directory . This is because the reports that are sent out to the stores are not necessarily the same ones that are available to use at the Main. This process can also be automated using the Scheduler. If you run the Synchronize>Synchronize Reports process at the Remote the system will download the whole report tree (all the subfolders and reports in them) it finds on the FTP Server to its C:/Main/Reports directory. When the process is completed these reports are immediately visible and available for use.